I like to read the Charles Apple’s blog. Charles Apple is a freelance visual journalist and instructor. A longtime news artist and designer, he is the former graphics director of the Virginian-Pilot and the Des Moines Register. He is currently en route (I am following his trip on Twitter @charlesapple) to his new job as the editor and designer of the Orange County Register‘s daily Focus page. 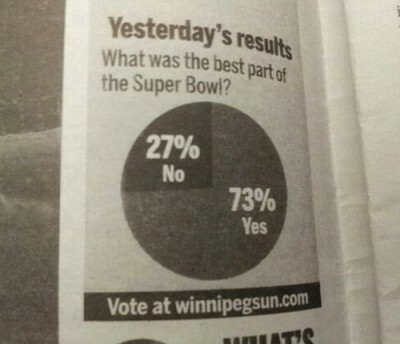 This interesting graphic from the Winnipeg Sun showing results of an informal poll of readers was making the rounds last night. Previous Post Infographic: How Much Do We Poop – And What’s In It?